I am new to this site and new to all of this. I was fired last week after the pharmacy did an audit and I showed up with 4 pages of discrepancies. Honestly, most of them could be explained.. But I was advised by my union rep to admit and be humble and plea for mercy. That is what i did. The 5 people sitting across from me seemed sympathetic...but i knew i'd get fired. The next morning i got fired over speaker phone. I was advised to self report to BON and my states assistance program... which i did. My state has an alternative to discipline program where my license is untouched as long as i comply for the 5 year contract. I go for my assessment in 2 days. I will be able to look for work right away, but am scared to DEATH about not finding a job and what i should tell them on interviews. The director of HR told my union rep they wouldnt be turning it over o the DEA because there wasnt enough discrepencies and I only admitted to a few. I was vague. I am still in shock and disbelief over this whole thing. The severe anxiety is easing up a little, now that I know what Im facing... but the depression is really getting bad. I feel like such a loser. Its humiliating. Especiallly since I lived with an addict for 3 years and swore i'd never end up like that... and also.. i had an almost brother in law who was a flight paramedic who was accused of stealing fentanyl 2 weeks before their wedding and told he would be prosecuted. He committed suicide 5 days before the wedding . I dont know what happened or how i got to where i am. I've never had an addictive peronality... i could smoke a pack of cigarettes a day for 2months and quit the next day. Im still struggling to believe i have an addiction vs severe depression and anxiety that I was self medicating for which disrupted the efficacy of my actual meds. But thinking back on my actions the past few weeks... the lengths i would go... just dont seem normal. My job atmosphere has been horrible for the past few years. We were on our 4th director in a year and I was quite often a target because of my mouth. The biggest reason i decided to admit was I didnt want them digging any more for fear of what they would find... which potentially could have been pretty bad. Im a single mom and feeling pretty alone and scared. Just looking for support through this horrible time (Merry ***** christmas to me). ED Nurse, RN has 9 years experience and works as a ED nurse, graduate student in AGACNP. I think it is time for you to just face the truth- that is how you start on the recovery path. While reading your post you never admitted to being an addicted and taking drugs. I think you need to get into a program ASAP in order to succeed. I think you need to get clean/help before trying to obtain further employment- you need to show you've made steps to improve yourself. I think it is time for you to just face the truth- that is how you start on the recovery path. I agree 110% with this. You've hit what I hope will be rock bottom for you. Time to start taking the steps to climb back out of this hole. It CAN be done, but you are going to have to dig deep and give it all of your effort. Best of luck to you. Crappy timing on the whole situation. Hang in there. Hmm...You usually can't work as a nurse until you are cleared by the program. This usually involves completing whatever treatment is recommended by your assessment. It sounds like you need the time to sort your head out, anyway. In my experience, the folks who lied their way to getting back to work quicker just ended up relapsing. But your mileage may vary. Take a deep breath. Get your assessment done. Treatment and meetings asap. Honesty is best but you dont have to tell em where you hid the bodies...dont worry about interviews this minute. You need help. Your post screams it. This will end up potentially saving your life and your career. Its going to be tough but it will be better. Lots of support here. You can do this! It took me a while to admit that I was an addict. Yet, I took pills from my employers. I went way beyond the point where it could be dismissed as discrepancies. It took a while for me to really see, that THIS WAS ME. There were, in the beginning, too many reasons why it just COULDN'T BE ME that did this. But it was. For now, get into treatment asap, find some NA meetings and start attending. Recovery and taking care of yourself must come first. Keep us posted. There are a lot of us here, and each one of us has been where you are. You aren't alone. Im lucky in that most of my co-workers have already volunteered to give me references (only 2 know whats going on and they are sticking by my side) including an NP or 2. I was a good nurse and my patients were well cared for and never denied any pain meds. I just lost my way... found a new 'friend' to help out when i felt most alone. Self imposed isolation, of course. I am scared to death to step foot in an AA/NA meeting. I know i should start... but i've never been to one and I dont kn ow what to do or expect and I certainly dont want to have to stand up and speak. Again- you seem to not think you have a problem- you stole controlled substances for personal use. I'm not trying to make you feel bad but you have a problem and need to admit it- not be less than truthful like you are implying you will do. You're headed down a dangerous path, get help soon. I had my assessment done today. I was honest with her, which she appreciated. She said she is going to fax in the diagnosis and recommend counseling and is referring me to a clinic she used to work with which is closer to me. That all depends on my state insurance application though. My state really doesnt have many inpatient treatment centers and you basically have to be suicidal to get in.. then its usually just a few day stay. I have a cousin who is BP and a very bad addict.. and the only way he can get in is to claim suicidal to get his meds adjusted. The anxiety isnt as bad anymore... but the depression is really setting in. I still cant believe i put myself in this position. Its like a bad nightmare. I realize i have a problem and need help.. but it just seems so hopeless to think of spending the next 5 years of my life held hostage by this program. I screwed up, i deserve to be where I am.. Im just having a hard time wrapping my head around it. Im scared to death about getting a job and am obsessively focused on it. I am a single mom and I dont have a husband/significant other to be there for me or help out financially. I feel very alone. But Im doing everything I can to prepare for this and get it started. Im kinda surprised im not just stuck in bed. I dont know a single other nurse who has been through this... wish i had someone to talk to who knows exactly what Im going through. Thanks for reading. I realize i have a problem and need help.. but it just seems so hopeless to think of spending the next 5 years of my life held hostage by this program ... I dont know a single other nurse who has been through this... wish i had someone to talk to who knows exactly what Im going through. Thanks for reading. You are already being "held hostage" by your addiction. Without getting help, you would still be a hostage to addiction five years from now. With a program, you can be coming out the other end and getting on with your life five years from now. The five years is going to pass either way; which outcome would you prefer? There are a lot of people with similar situations here, farther along in the process than you are now, as well as lots of newbies, and a lot of support available here (so, now, you do have people to talk to. :)). It would be a good idea to start attending AA/NA meetings. Many communities have groups specifically for healthcare professionals. But going to any meetings would be better than not going. As others have stated, you really should start attending the meetings. 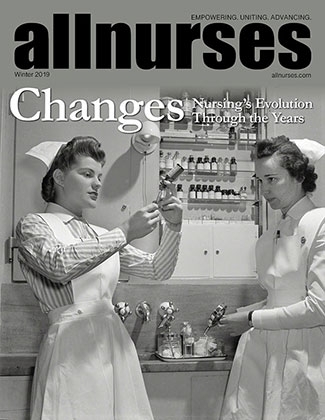 As part of the coursework for an elective that I took in college years ago (and again for my RN program now) I was required to go and attend two AA/NA meetings and write a paper about the process. The members there are all dealing with addiction and offer support to one another. You do not have to stand up or talk if you do not feel comfortable. Try showing up just to see how the whole process works. You may be surprised how many people may be going through a similar situation that you are going through but if you had ran into them in public you would never know that they have a problem. I'm sorry that this happened to you and the timing is just horrible. I do hope things work out for you soon. Hang in there. "By every form of self deception we thought we could find an easier softer way, but we could not!" If you are just looking to get through and get back to work you may find that relapse is just around the corner. In reading your posts which have addict written all over them - you are doomed to repeat this behavior. The only way we addicts get better is to be completely honest with ourselves. You need treatment and soon. At the very least 90 meetings in 90 days and an intensive out patient program. Good luck to you.